Battenburg Belle cooked a tremendous Thanksgiving dinner last night, ooh, it was marvellous. I’ve a feeling that might become an annual tradition, and why not? We don’t really do Thanksgiving here in the UK, but when everyone in the USA is having a party, why not us too? When I asked BB in an email what she was going to cook, the response was: “Diana Henry’s cider brined chicken with prunes, chestnuts and baby onions, with some traditional side dishes – roast spuds, sprouts, a green bean casserole, something to do with parsnips and/or sweet potato, bread sauce, cranberry sauce” CRIKEY! Oh yum, yum. So I volunteered to make the green bean casserole. To say this was easy is an understatement. The hardest thing was finding the crispy onions to go on top as these aren’t really a “thing” here in the UK and you have to hunt high and low for them. In my case “low” as in the big Tesco, after much searching I found some underneath the salad cream. 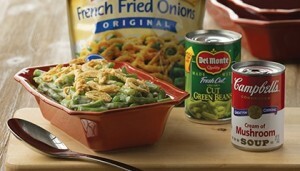 Green bean casserole isn’t a “thing” here either, but I know it is in the USA. Especially at Thanksgiving dinners. Jack’s version is a 3 ingredient special. Tinned green beans, cream of mushroom soup, crispy onions, that’s it. Oh, some salt and pepper, plus a little butter to grease the dish (which I forgot to do). Nobody around the table of 10 had ever had this particular delicacy before. Mr R passed, but I think everyone else tried some. Earlier on when I told Mr R what the three ingredients were he said simply: “Eugh.” Then a little later he asked me, “when you say crispy onions, do you mean pickled onions?” See, I told you crispy onions weren’t a “thing” here. 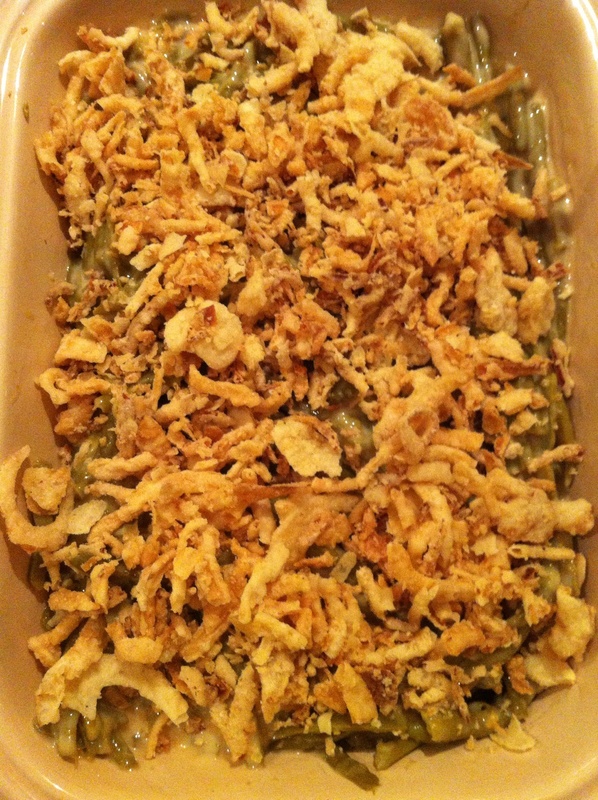 But in a strange turn up for the books, I really liked the green bean casserole. Despite the mushroom element. The chicken and all the side dishes were REALLY GOOD. All perfectly cooked, how does she do it?! 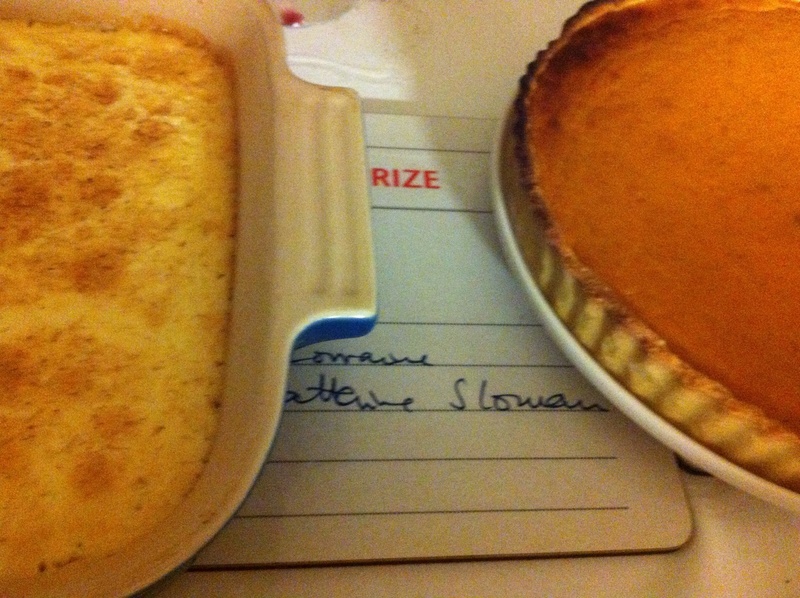 For afters there was a simply delicious rice pudding (Nigella Lawson recipe I think…) and a Vincent Price pumpkin pie which was also yummy. I look forward to seeing the full write up over at the Battenburg Belle blog sometime soon! Mind you, it might take a while as BB is going to be very busy, the PUPPY arrives today. Mr Rathbone was reading this over my shoulder and laughed out loud about the Pilgrims / Indians – ha ha – genius idea. 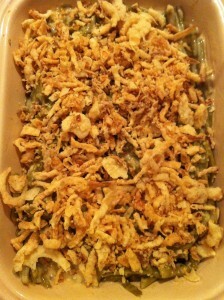 I might try making a green bean casserole to your recipe next year, that sounds GOOD. I like the bit that says, “clean and over cook the green beans” – Yes! I’m sure that’s the trick to making it more like the canned version. I was surprised (and pleased, naturally, that it didn’t taste at all mushroomy…. What else did you have for your Thanksgiving dinner? It was a feast! We started with pimento cheese dip with crackers…a 1950’s fancy party dip that Alex’s mom made for every holiday. I continue her tradition now, as it always puts Alex in the mood for festivities. The rest was a Recipes for Rebels menu (even though I got so busy, that all my photos were crappy and useless). The Reverend James DeWeerd’s Honey Rolls were outstanding! Dinner rolls made with yeast, mashed potatoes, flour, and honey…they were perfectly textured and light with just a hint of sweetness. For the STAR attraction, we had Marilyn Monroe’s Turkey and Stuffing. It was perfect. Garlicy mashed potatoes (because I made too many for the rolls…so the Potatoes Lyonnaise got scrapped). Gravy, cranberry sauce, the green bean casserole, and Aunt Ortense’s Persimmon Pudding with whipped cream. One guest brought a sweet potato pie and another brought chocolate cake. We ate until we hurt! Oops…Worcestershire sauce…at least that’s what I use from memory. It might make another appearance at Christmas dinner. Cannot wait to hear about the Christmas dinner too!! Oh my GOD Greg, this sounds absolutely AMAZING! I’ve always wanted to try Marilyn’s stuffing, but have been a little afraid of it. Do you have Fragments (the book the recipe originally appeared in) – it’s such a lovely book. Love Marilyn. I wasn’t planning a big Christmas extravaganza this year as my focus at the moment is my BIG birthday coming up – eek! But now I’ve read about your Thanksgiving I am tempted. If ever there was a recipe name to tempt one in, The Reverend James DeWeerd’s Honey Rolls is it! Arg, I am starving!! No…I don’t have that book. But the stuffing WAS great (and easy)! And you wouldn’t need to do a whole bird…you could still keep it small scale and do the stuffing in a pan (safer that way anyway)…one of your wonderful butchers can fix you up with giblets. 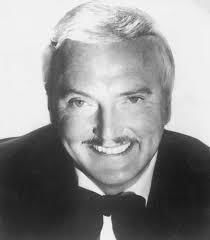 Make the rolls and a couple of breasts for you and Mr.R. (the leftover rolls worked out great as sandwich buns). Right, Marilyn’s stuffing and the Reverend James DeWeerd’s Honey Rolls are going on the “to do” list right now, yum yum! …but we love it (and love the leftovers even more)! Yours looks great! I’ll be looking forward to Battenburg Belle’s write up as well!